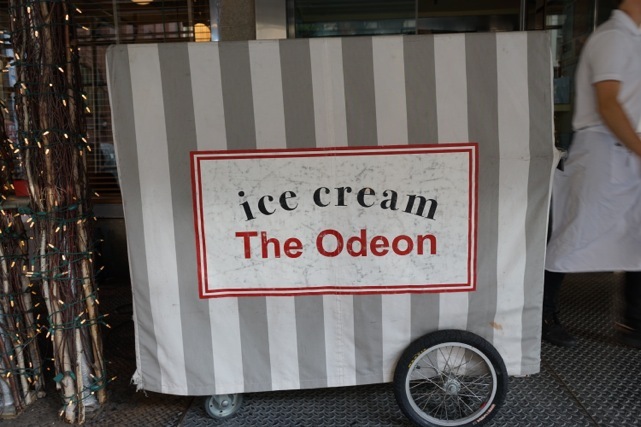 There are very little remnants of the Tribeca of the 80’s, portrayed in Jay McInerey’s Bright Lights , Big City, though Odeon, one of Tribeca’s pioneer restaurants still lives on after 30 plus years. Today, Tribeca is a low key, picturesque neighborhood of cobblestoned streets in Lower Manhattan, south of Canal Street and just above the financial center. 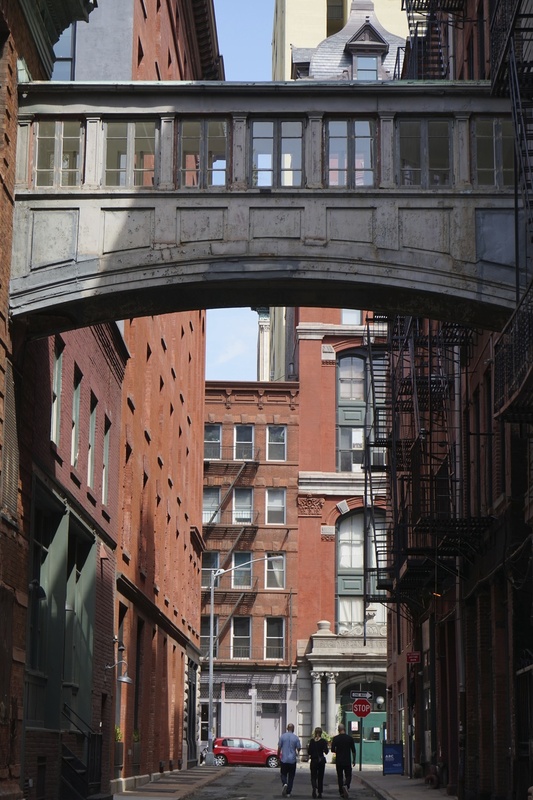 Commercial industrial warehouses have been turned into luxury residential buildings and lofts with high-end restaurants and shops catering to the many families that call this area home. Tribeca has a different feel than most of Manhattan, if you haven’t been in awhile plan a day soon! Coffee and a Bite: Start the day with Stumptown coffee, sweet treats or the daily toast at Baked, the second location of the well-loved Red Hook bakery. With killer sandwiches at lunch such as the Varlene, a gourmet BLT with roasted plum tomatoes and avocado, you just might chose to come back later. Or, right around the corner, head to Gotan, serving excellent coffee and light breakfast fare in a stylish space. With lots of charging stations and free WIFI you can settle in till lunch when the menu switches over to an array of tempting salads and sandwiches. Stretch: Head to Kula Yoga for a vinyasa (flow) style class. We’ve taken different classes; all the teachers are awesome, incorporating their own styles and slants (some using music) with a healthy “respect for the purifying power of sweat”. Check Kula’s schedule for upcoming workshops; with some catered to beginners there’s no excuse to not join in. Wet Workout: Looking to try something new? At Aqua, home to Aqua cycling, jump on a bike in 4’ of water for a workout that combines high intensity cardio and body toning with the benefits of water resistance. Garnering praise from the likes of Vogue, Glamour and Bazaar, this chic, airy space is the first of its kind in NYC. Clothes Horse: We love all of the Steven Alans and their flagship store on Franklin is our favorite, offering a well-curated selection of casual-wear and accessories for men and woman. Christina Lehr is a must stop for comfy basics, with a great selection of hard to find Closed jeans. N.Y. based, Israeli born designer, Nili Lotan showcases her high-end collection of simple and sophisticated women’s clothes in a gallery like space on Duane St. You’ll find unique designs at Annelore from designer Juliana Cho, all handmade next door to the store in her atelier. James Perse arrived in Tribeca this past June, carrying the men, woman and home collections he’s known for along with a very helpful and friendly sales staff. Lunch: Local favorite Bubby’s is the kind of place every neighborhood would be happy to call their own. The adorable diner-style restaurant is filled with everyone from groups of moms and kids, couples, businessmen and tourists all happily enjoying salads, burgers, fried chicken and the like. (Breakfast pancakes and huevos rancheros are still available at lunch.) Bubbys started as a pie shop so try and leave room for dessert. Looking for something more grown-up? You’ll be very happy over at Little Park from chef Andrew Carmellini serving a seasonal, contemporary menu. While the pastas and main courses are delicious, we’re very happy sharing a few of the small vegetarian plates, all bursting with flavor and originality. In a rush? Grab a to go sandwich at adorable take out Café Clementine, an Italian sandwich at Puffy’s Tavern or pick up a healthy salad platter and fresh juice at Mulberry and Vine. Beyond Clothes: A Japanese knife from Korin is a great gift for a lucky chef in your life, or if you want to treat yourself to something really special. Browse Stella’s for a wonderful selection of high-end linens, bath and bedroom accessories, pillows and towels. Room is the place for stylish, minimalist furniture and Carini Lang for stunning silk and wool handmade carpets from Nepal. Retreat: Aire Ancient Baths is a sanctuary in the heart of Tribeca, a high-end, atmospheric thermal bathhouse with a Hammam (steam room) and several pools including: salt water, warm, hot and cold-water pool. The bath treatments are booked in 2 hour blocks and you can add a massage to make it that much more heavenly and therapeutic. Aperitif: There’s a large menu of red and white (many sulfur free) by the glass at Racines, a wine bar that is an offshoot of the original Parisian bistro. Helmed by Michelin starred chef Frederick Duca is understandingly tempting to stay for dinner. After Dinner: To end the day in style sip a cognac at grown up, quiet Brandy Library where rather than books, alcohol lines the shelves. They encourage reservations and are open late, till 4am on weekends.